Perfect for those projects where you need maximum impact with a large bead (and minimum impact on your budget! 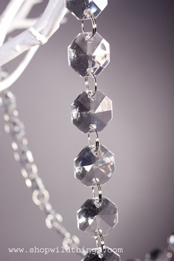 )...you will get 24 of these stunning crystals for $24.99! There is a large pre-drilled hole at the top of each piece with a handy silver jump-ring already attached. Also included are lengths of silver cord, or you can hang these using monofilament line. Creative uses for these would be in a window (make your own beaded curtain! ), hanging in plants, in a crystal wedding tree, on a chandelier, just about anywhere that you'd like some seriously beautiful and low cost elegance! To decorate the tree below, we used 15 feet of our 30 Foot Long Clear Beaded Strand and added 5 each of our Acrylic Pandants in "Miranda", "Carrie" and "Samantha" and "Bedazzling" styles. 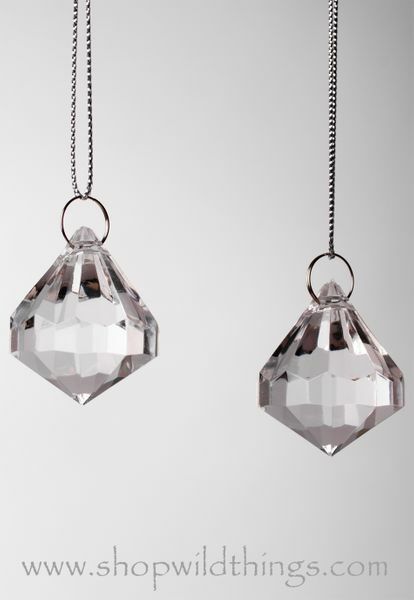 Each of the pendants has the matching jump rings attached making it a snap to add them to other garlands, to chandeliers, or to anything you can imagine! To decorate the tree in the image below, we simply used: 2 dozen Acrylic Garland Strands - Diamonds (item number 189300329), and an assortment of our acrylic ornaments! Each of the strands of beads that we carry that are attached to each other with jump rings are easily made longer or shorter, and adding the acrylic ornaments to the end just takes SECONDS! I love all the items I have bought from your site, I really love the fact that every invoice is personally signed, Thank you very much!!! !